When Black plays the low stone, it is a well-known plan in pro games for White to ignore it and play elsewhere. 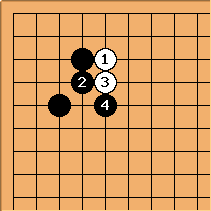 Black's next play here will be at or near a or b, depending on the importance of the sides. Of course if Black b and White a, White hasn't suffered much damage. White might in fact wait until Black has played both stones before reacting. 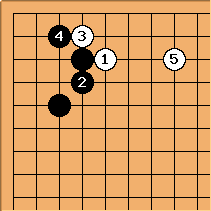 Coming out with the diagonal jump is a classic idea for light play here, as used by Shuho, Shusai, Sekiyama Riichi, Go Seigen. 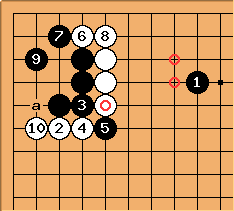 On the other hand one doesn't see White play tenuki after , in pro play. 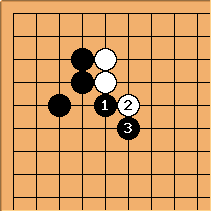 The double hane of and is just too good - White may never recover from this loss of good shape and influence. Here is a tewari analysis of the previous diagram. Starting from a black small low enclosure, is not the most usual, but also not abnormal. is a standard answer, but for white to next exchange for is a big loss, making her stone heavy and allowing black excellent shape with while white's own position is hardly helped. 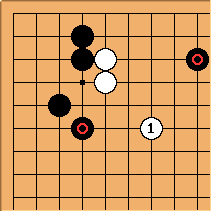 There are some pro games in which is played as a pincer, as shown, or at one of the marked points. 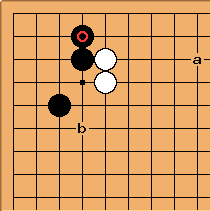 The sequence from to and then Black a is standard. 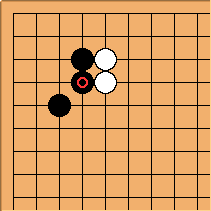 After that White must handle two weak groups in a cross-cut fight. White's ordinary moves in this situation are and .